The Times of Israel liveblogged Sunday’s events at they unfolded. German shipbuilder Thyssenkrupp releases a statement asserting that one of its steel manufacturing clients with ties to Prime Minister Benjamin Netanyahu was not involved in the sale of submarines to Israel. “GrafTech is one of the Thyssenkrupp Group’s hundreds of thousands of business partners, with sales volumes in the low range. But there are no business relations with the marine division,” the defense contractor says. According to Channel 13, the State Comptroller’s Office recently discovered that Netanyahu and his cousin Nathan Milikowsky were shareholders in publicly traded steel manufacturing company GrafTech International, which is a longtime supplier of Thyssenkrupp. A conflict-of-interest case involving Israel’s $2 billion purchase of German submarines from Thyssenkrupp is thought to be one of the biggest graft schemes in the country’s history. It has snared several close associates of Netanyahu, but not the premier himself. According to the report, Netanyahu did not disclose his holdings in GrafTech, which he had acquired when he was not prime minister. Milikowsky reportedly held 11 percent of GrafTech, while the number of shares held by Netanyahu was withheld by the comptroller. Netanyahu sold his shares to his cousin after he was elected prime minister in 2009, he said. The Jordanian parliament honors a Palestinian terrorist who killed two Israelis last week by reading a Quran chapter in his memory. Omar Abu Laila, 18, stabbed a soldier in the northern West Bank and managed to gain control of his weapon on March 17, before embarking on a shooting spree. The soldier, 19-year-old Sgt. Gal Keidan, was declared dead at the scene, and Rabbi Achiad Ettinger, 47, who was hit by a bullet fired by the terrorist as he drove by, died the next day. On Tuesday, the assailant was killed during a shootout with IDF soldiers near Ramallah after a two-day manhunt. “I salute the Palestinian people and the Jerusalemites… in beloved Palestine,” Atiyeh said during a parliament session last Monday. During today’s parliament discussion, Atiyeh stood up to salute Abu Laila again and recited the Quran passage, after which all the people present in the parliamentary hall rose to honor him. Meanwhile, a mourning tent for the terrorist was introduced near the capital Amman, according to Israel’s Kan public broadcaster. A prominent rabbi speaking at the launch of the United Torah Judaism election campaign has compared Israel unfavorably to Nazi Germany over the Jewish state’s failure to recognize the importance of separating men and women in daily life. Speaking at the event in the well-known Lederman Synagogue in Bnei Brak, Rabbi Aviezer Filtz, a prominent figure in UTJ and head of the religious seminary Yeshivat Toshia in the southern community of Tifrah, delivers a fiery speech on the importance of separate-gender seating on public buses. “Start to organize, to ride separately,” he urged his listeners, then explained that the principle is so fundamental that even the Nazi concentration camps during the Holocaust held to the policy. Forcing men and women to sit separately on Israeli public buses is illegal, but Haredi towns maintain private bus routes within and between major Haredi communities in which men sit at the front and women in the back. Three suspected Islamic State group suicide bombers have blown themselves up in northern Iraq, the army says, a day after the jihadists’ “caliphate” was wiped out in neighboring Syria. Army spokesman Yahya Rassoul says the incident took place in a region near the Syrian border, where jihadist sleeper cells are believed to be present. He says the suspects died as troops surrounded them but there were no casualties among government forces. Local officials say the suspects were killed as they were trying to attack troops in the village of Qayrawan, south of the mountainous region of Sinjar which borders Syria. Fighters of the US-backed Syrian Democratic Forces on Saturday pronounced the death of the nearly five-year-old IS “caliphate” which once stretched across a vast swathe of Syria and Iraq. Their victory was hailed as a major landmark in the battle against the jihadists but there have also been numerous calls for “vigilance” with many saying the fight is far from over. Diehard jihadists continue to have a presence in mountainous or desert regions between Syria and Iraq, which had declared victory over IS in December 2017. Prime Minister Benjamin Netanyahu has landed in Washington where he will be speaking Tuesday at the AIPAC policy conference and meeting with US President Donald Trump in the White House. “The scurrilous charge of dual loyalty is a signal and that signal amplified by social media is now empowering people who have long opposed our cause and everything we have built,” Kohr says. “Critics are emboldened and energized and their false claims are taken at face value by new and broader audiences,” Kohr adds. “They say you cant be a good campus leader and support of Israel. They say you can’t be a good progressive and supporter of Israel; and now they’re saying you can’t even be a good American and be a supporter of Israel. “The intense hatred of Israel is creeping from the margins to the center of our national politics,” says Kohr. “They have our attention… We will respond,” he says. Romanian Prime Minister Viorica Dăncilă announces at the AIPAC policy conference in Washington that her country will be moving its embassy to Jerusalem. “Moving the American embassy is emblematic and it proves the powerful connection of values and interests between the American people and the Israeli people,” Dancila begins. Honduras President Juan Orlando Hernández tells the AIPAC Policy Conference that his country will “immediately” open a diplomatic mission in Jerusalem. “Honduras will immediately open our official diplomatic mission and this will extend our embassy to the capital of Israel, Jerusalem,” Juan Orlando Hernández tells the crowd. Last year, Honduras was one of only eight countries that opposed a UN General Assembly resolution condemning US President Donald Trump’s December 2017 recognition of Jerusalem as Israel’s capital, along with Guatemala, Israel, the Marshall Islands, Micronesia, Nauru, Palau and Togo. New Right party leader Naftali Bennett accuses political rivals ex-army chief Benny Gantz and former defense minister Moshe Ya’alon of being responsible for the deaths of two IDF soldiers and the snatching by Hamas terrorists of one their bodies during the 2014 conflict in the Gaza Strip. “This entire terrible incident stems from the rules of engagement that Benny Gantz and Bogie placed on IDF soldiers,” Bennett says using Ya’alon’s nickname during an interview with Radio 103FM. Gantz was Israel Defense Forces chief of staff and Ya’alon was defense minister during Operation Protective Edge, a seven-week conflict during which the IDF battled against Hamas-led Palestinian terror groups inside the Gaza Strip. A key Israeli objective was the destruction of cross-border tunnels dug by Hamas and used to carry out attacks inside Israeli territory. There were various temporary lulls in the fighting indirectly agreed to by Israel and Hamas, sometimes only on specific areas of the Palestinian coastal enclave. During one of those lulls, on August 1, 2014, IDF Maj. Benaya Sarel and Lt. Hadar Goldin were participating in an operation to find and destroy Hamas tunnels. They were ambushed by Hamas gunmen and both killed. Hamas members grabbed Goldin’s body and his remains, along with the remains of another IDF soldier Oron Shaul who was killed in a separate incident. The bodies of both soldiers are believed to be held by Hamas. Prosecutors indict two Jerusalem teenagers for firebombing a police post on the Temple Mount holy site in the capital’s Old City earlier this month. The suspects — a 15-year-old and a 17-year-old — were charged with four counts of terrorist activity: using a weapon for terrorist purposes, terrorist arson, aggravated terrorist assault and aggravated attempted assault on a police officer. The names of the teenagers and any identifying details have been barred from publication as they are minors. On March 12, a firebomb was thrown at officers standing guard on the Temple Mount, known by Muslims as the Haram al-Sharif, leading to several arrests and low-level clashes on the platform. The Central Elections Committee announces that public transportation — buses and trains — will be free of charge for Israelis on election day this coming April 9. Palestinian Authority President Mahmoud Abbas reacts to US President Donald Trump’s tweet last week that the US will recognize Israeli sovereignty in the Golan Heights. US President Donald Trump will sign an order recognizing Israel’s sovereignty over the Golan Heights when he meets Prime Minister Benjamin Netanyahu in Washington on Monday, Israel’s foreign minister says. “President Trump will sign tomorrow in the presence of PM Netanyahu an order recognising Israeli sovereignty over the Golan Heights,” Foreign Minister Israel Katz writes on Twitter. Again breaking with longstanding international consensus, Trump said on Thursday that the United States should acknowledge Israeli sovereignty over the strategic plateau it seized from Syria in the 1967 Six Day War. The prime minister is locked in a tough election campaign with a centrist political alliance headed by former military chief Benny Gantz and ex-finance minister Yair Lapid. Weiss posted on Twitter after landing that she realized that the video had been inappropriate, apologized, and took it down. The Rishon Lezion Magistrate’s Court extends by five days the remand of Miki Ganor, a state witness in a high-profile corruption case who was arrested after he requested to change his testimony. “The concern of obstructing an investigation has become stronger and even expanded to additional areas,” declares Judge Einat Ron. Ganor was arrested last Tuesday after informing police of his intention to “change the version he gave during the investigation” into corruption suspicions surrounding the purchase of submarines from Germany’s Thyssenkrupp for Israel’s navy. He said his confessions to bribing multiple officials had been given under duress and were not true. A senior Palestinian official condemns a pledge by Romania’s premier to relocate her country’s embassy to Jerusalem, saying he would urge the European Union to intervene. Romania’s Prime Minister Viorica Dăncilă told a pro-Israel lobby conference in Washington earlier today that Bucharest would seek to relocate its embassy from Tel Aviv to Jerusalem, as Honduras also announced the opening of a diplomatic office in Israel’s capital. Dr. Saeb Erekat on #Romania's announcement to move its embassy to #Jerusalem: A blatant violation of Palestinian rights, international law, and UN resolutions. It only contributes to eliminating the two-state solution, the only way towards peace and stability in the whole region. WASHINGTON — Addressing Israeli reporters in Washington, Blue and White party leader Benny Gantz attacks Prime Minister Benjamin Netanyahu for focusing only on his personal issues and his legal woes and neglecting other national priorities. At the same time, he continues to refuse to speak about the reports of Iran having hacked his phone, insisting that it contained no material that could potentially pose a security risk. “I watched the Netanyahu interview last night. And I have to say is that I am very worried. It was a 40-minute interview, and it was all about Netanyahu. Nothing about the issues that Israelis are concerned about,” he says. Authorities are currently investigating whether a fire that started near the southern town of Eshbol was caused by an incendiary balloon from Gaza, the Kan public broadcaster reports. A second survivor of the shooting last year at Marjory Stoneman Douglas High School has died by suicide, Coral Springs police confirm to the Miami Herald. Investigators tell the Herald that the student died in “an apparent suicide” on Saturday night. The death comes a week after a graduate of the same school, Sydney Aiello, died by suicide in her college dorm room. She had been diagnosed with PTSD after the mass shooting. A man is lightly injured by a balloon-borne incendiary device flown into southern Israel from the Gaza Strip, the local government says. The object landed in an open field in the Eshkol region. It was at least the second such device to touch down in Israel from the Strip today. A shepherd who was standing nearby sustained burns to his hand, an Eshkol spokesperson says, calling for people to contact security officials in such cases. A Molotov cocktail has been hurled at an empty bus near the northern West Bank settlement of Kedumim, the Walla news site reports. No injuries have been reported as the vehicle was empty. He says Democrats are concerned there will be no “bombshell” in the report, so they are pursing more investigations of the president. Attorney General William Barr received Mueller’s report on Friday and says he will give Congress a summary as soon as this weekend. Prime Minister Benjamin Netanyahu praises his Romanian counterpart Viorica Dăncilă, who announced earlier today at the AIPAC policy conference that her country would move its embassy to Jerusalem. Any such decision would require the approval of the president of Romania, who has spoken out against such a move. Romanian President Klaus Iohannis says his country’s prime minister Viorica Dăncilă showed “complete ignorance regarding foreign affairs,” when she announced earlier today at the AIPAC policy conference that her country would move its embassy from Tel Aviv to Jerusalem. “The final decision (on the matter)… rests with me,” Iohannis tells AFP. He also suggests that Netanyahu may have worked with Russia to hack his cellphone. Central Elections Committee chairman Hanan Melcer rules to reject a request from the Union of Right Wing Parties to bump Otzma Yehudit candidate Itamar Ben Gvir up two spots on its joint list for the upcoming elections, in order to take the place of his disqualified colleague Michael Ben Ari. Concurring with the position of Attorney General Avichai Mandelblit, Melcer determines that the current law does not grant his committee jurisdiction to alter Knesset lists once the deadline has passed. The URWP blasts the decision, saying that, “as expected, Justice Melcer fell in love with the procedure and abandoned the essence.” The right-wing party has argued that the unprecedented nature of the Supreme Court’s decision to disqualify Ben Ari for incitement of violence warranted flexibility in allowing them to alter their list accordingly. Each candidate after Ben Ari was bumped up one spot, after the Supreme Court decision. An explosive device, apparently flown into southern Israel from the Gaza Strip, detonates in a community in the Sha’ar Hanegev region, the local government says. The blast causes neither injury nor damage, a Sha’ar Hanegev spokesperson says. “An explosion was heard in one of the communities in the region. Following a search, the site of the blast was found,” the local government says in a statement. The explosive device appears to have been sent into the community by a cluster of balloons from the Gaza Strip, but this has yet to be confirmed, the Sha’ar Hanegev spokesperson says. It would be the third such device flown into Israel from Gaza today. The left-wing Meretz party has appealed to the Central Elections Committee to bar the live-streaming of Prime Minister Benjamin Netanyahu’s speech at the AIPAC Policy Conference on Tuesday on grounds that it would be considered campaigning. Thus far, in the campaign, the committee has required similar speeches from candidates to be broadcast with a 10-minute delay. Attorney General Avichai Mandelblit says Prime Minister Benjamin Netanyahu offered to divulge confidential information about the sale of German submarines to Egypt, but the revelation was ruled unnecessary and no such intelligence was ultimately shared. The statement from Mandeblit contradicts Netanyahu’s account on Saturday, when the prime minister told Channel 12 that the attorney general and his staff were apprised of the sensitive information on Berlin’s sale of the weaponry to Egypt. A new poll from Channel 12 has the Blue and White party maintaining a lead over the Likud, while also unlikely being able to form a 61-seat coalition. The survey also predicts that Moshe Kahlon’s Kulanu party would not cross the electoral threshold. BBC Arabic published a report over the weekend on a widely shared anti-Sissi hashtag — “Don’t worry, you’re not alone” — which called for demonstrations against the president. The BBC’s coverage has been branded “insulting” by the State Information Service, accusing the broadcaster of inciting “violence” and being a “propaganda tool” for the outlawed Muslim Brotherhood. The report “breaches the most basic codes of conduct… fabricating events that never took place,” SIS said in a statement. It urged “all officials and Egyptian intellectuals” to boycott the BBC until the broadcast apologizes. A BBC spokesperson in London earlier says, “To our knowledge ,we are fully compliant” with SIS regulations. Explosions and gunfire are reportedly being heard on the Palestinian side of the Gaza border, as a result of violent rioting that has increased in recent days. Two incendiary devices believed to have been sent from Gaza have exploded near Israeli towns thus far today. Prime Minister Benjamin Netanyahu responds to a statement from Attorney General Avichai Mandelblit, which refuted the premier’s account regarding his approval of a German sale of submarines to Egypt, that Berlin had already sold to Israel. 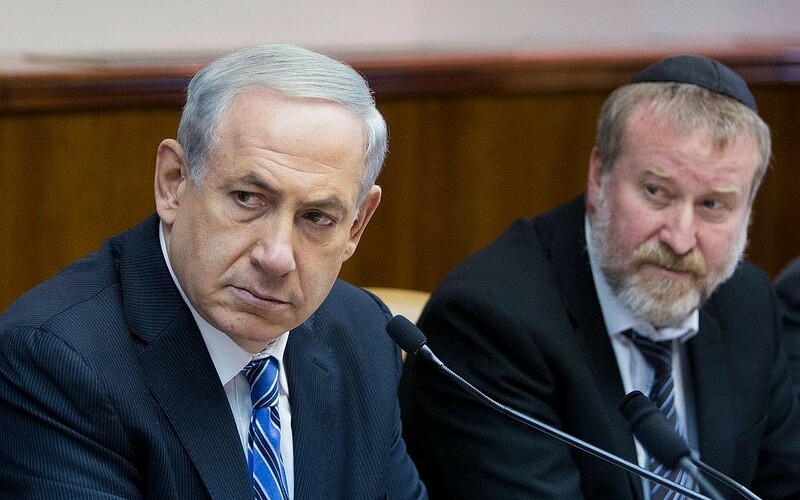 “Prime Minister Netanyahu spoke with the attorney general tonight and invited him to a meeting, together with the national security adviser, in which he will update him on the remaining confidential details,” according to Netanyahu’s office. Mandelblit said earlier this evening that Netanyahu offered to divulge confidential information about the sale of German submarines to Egypt, but the revelation was ruled unnecessary and no such intelligence was ultimately shared. The statement from Mandeblit contradicted Netanyahu’s account on Saturday, when the prime minister told Channel 12 that the attorney general and his staff were apprised of the sensitive information on Berlin’s sale of the weaponry to Egypt. An Israeli tank fires at a Hamas post east of Beit Hanoun in northern Gaza, following a number of border attacks throughout the day, the army says. “An IDF tank attacked a military post belonging to the Hamas terror group in the northern Gaza Strip, in response to explosive devices that were thrown [at the security fence] and balloons carrying explosive devices that were launched throughout the evening,” the military says in a statement.